from Commander Steel, Max Mercury and The Infinity Man all the way up to The Justice League of America! Sgt. Rock, Johnny Thunder and Viking Prince are among the company's many stalwart do-gooders! And then there's Ambush Bug. Ambush Bug was an ambiguous guy. When he first appeared (DC Comics Presents #52, December, 1982), he was the villain in a team-up between Superman and The Doom Patrol. Before long, he was a superhero of sorts, but not because he had a change of heart. It was more like he lacked purpose and direction, and wasn't entirely in touch with the world around him. Hero or villain, he never accomplished much, except to get a few laughs out of readers, along with the occasional puzzled shake of the head. That issue of DC Presents was written by Paul Kupperberg (who, among his other DC credits, scripted many of He-Man's comic book adventures) and drawn by Keith Giffen (Lobo, Omega Men). 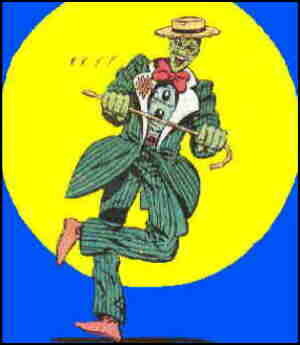 Giffen is the one who stayed with the character, which these days, is generally thought of as Giffen's own. Ambush Bug's superhero credentials lay in the fact that he could teleport. At first, he was limited to appearing in places where he'd already seeded his "bugs" as receiving apparati, but later he became able to go anywhere. He was originally Irwin Schwab, and how he got this power was never fully explained. In fact, pressed for a definitive origin story, the most coherent explanation Giffen gave was "We thought him up!" Over the next couple of years, Ambush Bug made several appearances with other characters, including a very memorable one with a bunch of Legion of Super Heroes rejects called The Legion of Substitute Heroes. He graduated into his own title, or at least a four-issue mini-series, dated June through September, 1985, then had a special, Ambush Bug Stocking Stuffer, in December of that year. In '86, he did a six-issue mini-series titled Son of Ambush Bug, in which he met his partner, Cheeks the Toy Wonder, a cast-off baby doll. The character's heyday was in the mid-1980s. In fact, at the end of Son of Ambush Bug, he was officially thrown out of the DC Universe, forced to discard his costume and get on a train bound for Reality. But he continued to turn up from time to time, and even had another special in 1992, The Ambush Bug Nothing Special. In 2001, he was actually part of a superhero group, The Justice League of Anarchy, which also included Plastic Man, The Creeper, Harley Quinn (from the animated Batman), 'Mazing Man and The Trickster (a bad guy from the '60s Flash), which made a one-panel cameo in a series exploring variations on the old Justice League theme. Ambush Bug is declared defunct from time to time, but never quite seems to go away. Text ©2006 Donald D. Markstein. Art © DC Comics.